Since Edelstein Turmaline debuted in 2012, we have become accustomed to seeing Pelikan release a new ink annually as part of their Ink-of-the-Year series. These releases have been restricted to the relatively newer Edelstein line. In contrast, Pelikan’s much older and mature 4001 line of inks does not often see a new release. According to the company, as of January 2016, that is about to change. 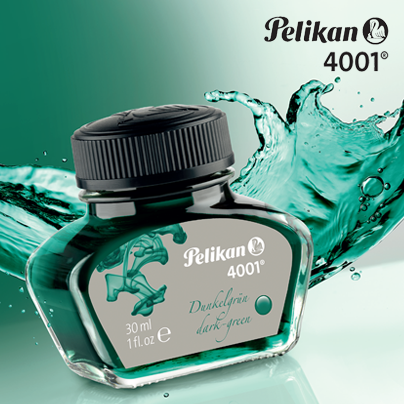 In a somewhat surprise announcement to their Facebook page yesterday, Pelikan revealed 4001 Dark-Green. The 4001 line is now well over 100 years old having been dubbed in 1898 and is very well-regarded for its properties, particularly its ability to tame the wet feeds of Pelikan’s pens. Details are sparse right now and it is not entirely clear as to whether this will be a limited edition but I suspect it will likely be part of their standard line-up. If so, Dark-Green will join the eight other inks in the line as well as pink which is only available in cartridge format. I would expect this release to be found in flacons as depicted as well as standard international cartridges. We won’t have to wait long for this one if next month’s release date is accurate. I really like a nice dark green ink for my writing so I’m excited to see just what shade we’ll get with real world use. What do you think of this new release? I look forward to reading your thoughts below. Interesting. The photo seems to indicate that it’s a blue-green, and sure enough (in reply to a question on the Facebook page you’ve linked to in your blog post) Pelikan states that “4001 dark green additionally has more parts of blue than [Pelikan Edelstein] aventurine”. I agree that it definitely appears to have a bluish-tinge. I’m very interested to see how this will play out. I can’t wait to see a writing sample. Alguna muestra y comparativa con la verde brillante. Check out this link which reviews the 4001 Dark Green; http://www.fountainpennetwork.com/forum/topic/304520-dark-green-pelikan-4001/. You can see a comparison with Brilliant green in there. 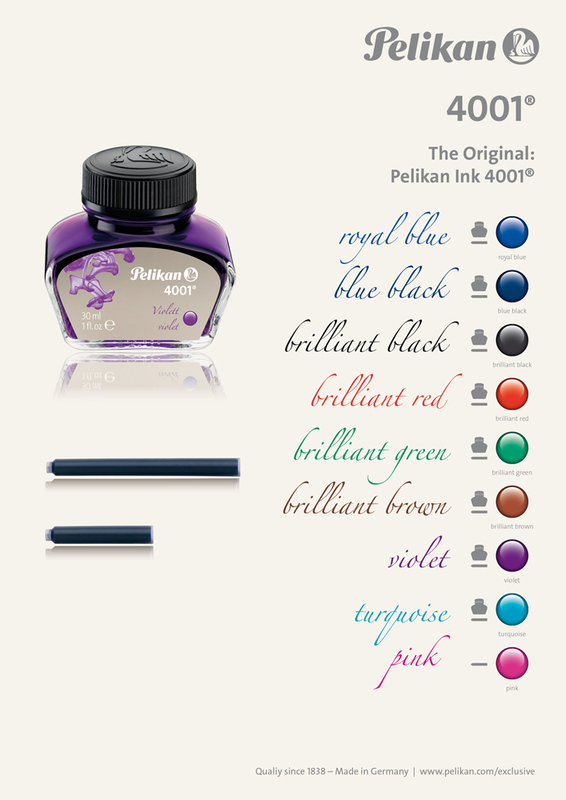 I love dark green inks, but this doesn’t look very dark in Pelikan’s ad. In fact, it looks a bit like mouthwash. I’m interested, but I’ll wait to see some reviews before purchasing. I share your concerns which is why I’m reserving judgement until this is out in the wild. Personally, I’m hoping for something like a Private Reserve Sherwood Green. I will eagerly be awaiting the early reviews on this one. I too am all about rich dark greens. It seems to me that both 4001 and Edelstein inks are generally not very saturated. You can have a dark color but if the ink is not very saturated with the coloring agent (pigmernt?) then the color will be washed out. Hopeful, anxious, cautiously optimistic? Should be interesting. I agree with your comments about saturation. That said, these are very user friendly inks that are relatively low maintenance. They are not highly prone to stain or damage our pens which I appreciate. It’s nice to have an ink that I don’t have to be nervous about using. If the saturation were to be increased, I’m sure we’d have trade-offs with some of that. Note that the color/darkness/saturation of the ink line also depends on a couple other variables. One of those variables is the paper. Specifically the absorbancy of the paper. I wrote with Cross/Pelikan blue in my notebook, and it looked great as it came out of the pen. But after a minute, the ink and some of the dye soaked into the paper, where it became invisible to my eye. Result was a faded looking ink line. A paper that would not soak in the ink as much, would probably show a darker ink line, with more of the dye on the surface of the paper, where it is visible. The second variable is the pen. Same ink and paper as above, but switched to a different pen (Pelikan 140), and I had a darker ink line on the paper. Some of my pens just write darker with the same ink than other pens, even when the other pen is adjusted to write WET. Since I like dark greens, I will be trying a bottle. I figure that I can always darken it with black ink, to get it darker. I have not gotten around to trying a mix of brilliant green + brilliant black, to see what kind of dark green I can get. There are so many variables that go into the appearance of the ink on the paper, you are absolutely correct about that. I like to keep it pure but there are a lot of people who mix inks to achieve a desired effect. I’d be interested to see that brilliant green/black combo.